A3 Size 10.7 x 13.6 in. (272 x 345 mm) 11.7 x 16.5 in. This magnificent oil painting by Samundra Man Singh Shrestha took five months to paint. It was completed in 2006, and is Samundra's most ambitious composition to date. The painting depicts the four-armed mother goddess Kaumari, as she offers a skull-cup of blood from a freshly sacrificed buffalo to her four-armed consort, Chanda Bhairava, in order to appease his great wrath. The scene of this bloody sacrifice is set in the Mul Chowk courtyard near the great three-storied Taleju Temple in Kathmandu's Durbar Square. The sacrificial tethering post and blood-pit of the courtyard appear in the left foreground, with the gilded doors and torana of Mul Chowk's small two-storied Taleju Temple appearing above. The Malla Kings of Nepal constructed great temples to honour their royal tantric goddess, Taleju Bhawani, which are situated near the old royal palaces in each of the three great principalities of the Kathmandu Valley. According to legend the goddess Taleju once became very angry with the king and refused to manifest again in her wrathful Durga-like mother-goddess aspect, and decreed that in future she would only manifest in the form of a young 'virgin-goddess' or kumari. The Royal Kumari of Kathmandu is selected from the Newar Buddhist Shakya caste as a young girl, who traditionally retains the divine status of a 'virgin-goddess' until the onset of her menstrual cycle. As a goddess the Kumari is simultaneously an embodiment of the powerful matrika or 'mother goddess', Kaumari, who is the female counterpart of Kumara, the 'youthful' son of Shiva and the brother of Ganesh. The 'eight mother goddesses' (astamatrika) are the consorts of the 'eight Bhairavas' (astabhairava), and Kaumari's consort is Chanda Bhairava. This scene takes place on the eighth 'dark night' (kalaratri), of the Dasain or Durga Puja festival, which celebrates Durga's victory over the evil buffalo-demon, Mahishasura, when traditionally a hundred-and-eight buffalos and goats are sacrificed in front of the Taleju Temple at Mul Chowk. Kaumari is beautiful, youthful and vermilion-red in complexion, with four-arms and three piercing eyes. She leans towards the right as she dances, with her left foot pressing upon the buffalo's leg and her right foot resting upon its severed head. She wears the garments and ornaments of the Kumari, with an embroidered red silk bodice covering her full breasts, a matching red silk skirt that covers her lower body, and above this an ornate red cloth apron (jabhin) and valance, which are embellished with ornaments of precious metal and bound by her golden belt. She wears the Kumari's silver rings on the first and third finger of each of her hands; heavy golden bracelets, armlets and anklets on her arms and feet; small golden dancing bells that are tied around her shins; and heavy golden earrings. Around her neck she wears an ornate golden choker, and a long necklace of silver-plated heads (narasilamala) that hang from a delicate silver chain. Her long black hair hangs beneath her golden five-jeweled crown, which is ornamented with five skulls, square victory flags, and five ornamental silver kikinpa blades. Kaumari's forehead is cosmetically adorned with vermilion pigment, and her three lotus-like eyes are heavily lined with black kohl. With her first pair of hands she makes the bindu-kapala-mudra as she offers a skull-cup of buffalo blood to Chanda Bhairava's mouth with her right hand, while touching the third finger and thumb of her left hand in the bindu-mudra. 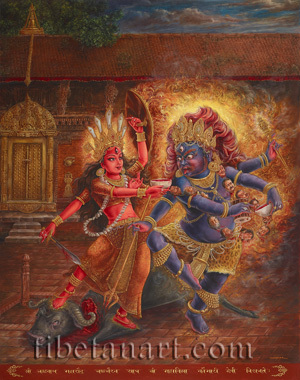 With her second right hand she holds a bloodstained sword, and with her second left hand she holds aloft a large shield that deflects the blazing fire that emanates from Bhairava's body. Chanda Bhairava, meaning 'the fiercely-terrifying', is extremely wrathful and blue-black in colour, with four arms and three bulging eyes. In bow-and-arrow posture he dances on the paved floor of the Mul Chowk courtyard, with his fiery left foot cracking the tiles upon which he stamps. His powerful and corpulent body is surrounded by a blazing mass of fire that emanates from the pores of his skin, while his tawny hair-locks stream upward against the intense glare of his fiery halo. His naked body is smeared with ash and blood, and he wears a leopard-skin loincloth and an ornate golden belt, from which hang jeweled loops of pearls and a heavy gold-plated valance or jabhin. Around his neck he wears a heavy golden choker embellished with the image of kirtimukha, and a garland of blood-dripping asura heads that are strung together on two delicate golden chains. A golden breast ornament is looped around his upper body, which is strung with little golden bells and adorned with a square reliquary-box at its crossed centre. He wears a gold ring and a silver ring on the first and third fingers of each hand; heavy golden bracelets, armlets and anklets; and around his shins many little golden dancing bells are fastened. Bhairava's wrathful face turns towards Kaumari as his baleful eyes stare into the skull-cup of blood that she offers him. His three bulging eyes have a startling liquidity with bloodshot veins that emphasize their roundness. His cheeks are smeared with blood; the hair of his eyebrows, moustache and beard blaze upward like tongues of red fire; and his gaping mouth reveals his protruding bloodstained tongue, sharp upper teeth and pointed fangs. His golden earrings are adorned with coiled serpents; his golden crown is adorned with five intricately mounted gemstones, and its headband is decorated with two naga-serpents, a central head and four skulls, which are joined together with hanging loops of pearls and jewels. With his first pair of right and left hands Bhairava holds a wooden damaru and a skull-cup, and with his second pair of hands he holds a long golden trident and a heavy golden club that is crowned with four skulls and a vajra. At the back of Mul Chowk's tiled courtyard are the steps that lead to the gilded doors and torana of the Taleju Temple, which glows from the reflected light of the blazing wisdom fire that emanates from Chanda Bhairava and Kaumari.